J.C. Matthew Ministries is committed to advancing God's Kingdom through understanding and empower people to overcome obstacles and realize their God given purposes in life by employing the concepts, laws and principles upon which the God's Kingdom operates! Its Kingdom Conscious family of organizations (J.C. Matthews Enterprises, Int'l) are designed to minister to the whole man: Mind, Body & Spirit. 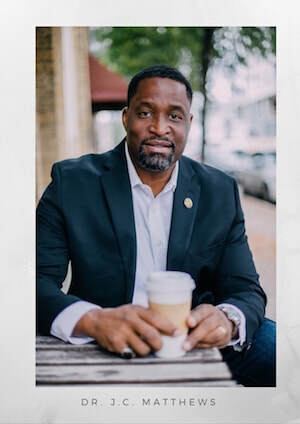 Dr. J.C. Matthews is an author, pastor, mentor international speaker who has embraced his assignment of advancing God’s Kingdom through understanding by teaching the Body of Christ the concepts, laws and principles upon which God’s Kingdom operates. He is also committed to empowering people to overcome the obstacles in life and realizing their life’s purpose. J.C. possesses a B.A in Political Science, as well as a Juris Doctorate (J.D.) degree, with an emphasis in Labor and Employment Law. J.C. was twice the recipient of the prestigious "Who's Who Among American Law Students Award” in recognition of his outstanding study of law, in addition to being honored by the Ohio State Senate’s General Assembly as an Urban All-American. JC's legal training and keen understanding of the Bible enables him to effectively communicate in a practical and simplistic manner seemingly complex concepts, laws and principles of the Kingdom. J.C. is also the founder and Chancellor of the International Kingdom Institute and Reign International Ministries, while functioning as the Apostolic overseer of the International Association of Ambassadors. J.C. has authored over a dozen books, the majority of which are dedicated to teaching the concepts, laws and principles upon which God’s Kingdom operates. J.C. and his wife Gena, reside in the Dallas/ Fort Worth Metroplex and share 4 children, and 2 grandchildren. Gena Matthews is a gifted speaker, pastor, author and leader who has traveled globally inspiring and mentoring others to achieve their greatest potential. Gena possesses a Master of Arts degree in Human Services Counseling (M.A.) with a focus on Marriage and Family, and has vast experience coaching and mentoring women all over the nation and globally. Her greatest desire is to see others walk in the purpose that God has for them. Gena has written several books. Her articles and devotionals have been featured on some of the leading Christian internet websites. Gena is known for her in-depth knowledge of God's Word and desire to empower women through a Kingdom perspective. Gena is the founder of Queens' Mentoring as well as the Queens' Reprieve, a Kingdom-minded women's retreat. She is also the Co-Founder of Reign International along with her husband Dr. J. C. Matthews. Gena is also co-host of the Kingdom Teaching Television Program "The Embassy".